I’ve written about the “It Gets Better” videos before, but this video — created by (the awesome) Susan Blackwell, (the rock star) Hunter Bell and (Bird Bird II) Matt Vogel — deserves to be plugged because it addresses bullying across the spectrum, not just LGBT. Almost everyone who is different is bullied, verbally, physically, emotionally. Every teens deserves to have someone tell them it gets better. Also great about this video, it gently reminds adults to be proactive, to keep their eyes open, their ears and mouths ready to respond, and to listen. I keep a list of the songs I write by, which was inspired by a writer-friend who keeps her soundtrack lists on her website (Update: They’re MIA on Catherine’s site now, but email her, if you’re curious). Every piece I write has a different soundtrack. When I’m on a writing binge I get stuck on one artist, whose songs I have memorized, and play them on repeat. After a while I don’t hear the music anymore, but there’s something about the rhythm and having a soundtrack by which to write, that’s important to me. I’ve been listening to a lot of Adele lately. This particular song, “Cold Shoulder,” works nicely with the play I’ve been working on about relationships, finding them, losing them, etc. 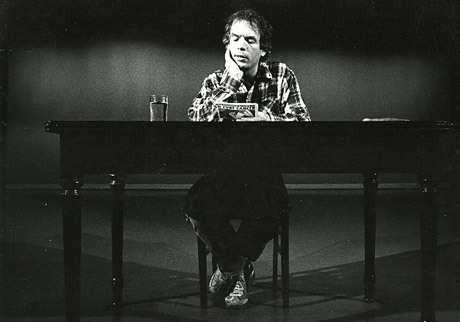 Spalding Gray‘s name is scribbled all over my work notebooks from 2002-2004, but I did not know who he was or what he did. I never met him in person, but I will never forget his voice, with that thick, New England accent. I first talked to Spalding in 2002, when he would call the office where I interned to talk to my boss, who was a friend of his and had directed one of his monologues. My boss would always take Spalding’s calls with enthusiasm, happy to talk to him until work interrupted their convivial conversation. As the years went by, I noticed Spalding’s voice developed a heaviness to it that hadn’t been present before. He had had an accident. It was clear that he was depressed. He still called the office where I worked, but I began to take messages instead of connecting his call immediately. Sometimes, Gray talked to me beyond the scope of the message. I listened, not always certain if he was telling me a story with an ending or simply rambling till I found a way to beg off the call. I remember passing newsstands when Spalding was missing, his face on the cover of the Post and the Daily News. A few months later, his face appeared on the covers again, when his body was pulled from the East River. 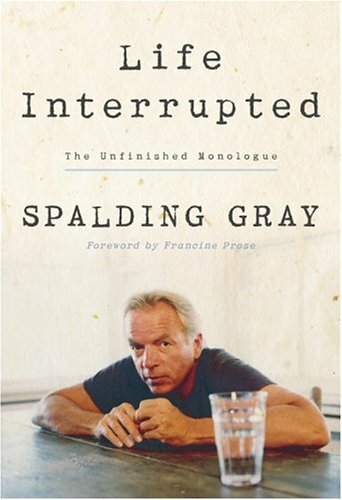 This is when I discovered Spalding Gray. I borrowed his filmed monologues from my boss and watched them one after another. I read the transcripts. 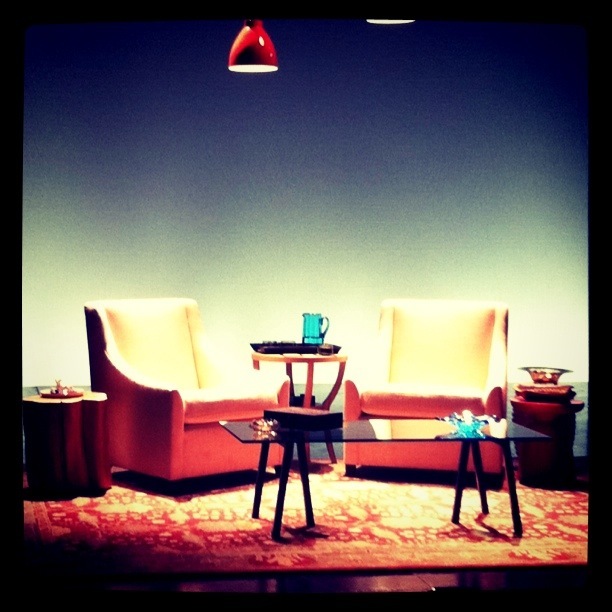 I was blown away by how one man, sitting at a desk with a single glass of water as a prop, could navigate an audience to places as far away as Cambodia and as close as New York City, piloted only by his words. His last monologue, “Life Interrupted,” published posthumously, was unfinished. It was also one of his best. There’s a darkness, a light, a hope, a humor, a sadness, and a beauty to it that no other written work I have come across has ever captured quite so intimately. I can’t imagine how Spalding would have finished this monologue or if he would have at all. There’s something about an unfinished work; a sense of incompleteness, of restlessness; that allows a writer to continue living in our minds, giving us the freedom to compose an ending worthy of his singular voice.